Clothed in soft white garments, she draws out through a comb the heavy mass of hair like thick spun gold to fullest length; her head leans back half sleepily, superb and satiate with its own beauty; the eyes are languid, without love in them or hate; the sweet luxurious mouth has the patience of pleasure fulfilled and complete, the warm repose of passion sure of its delight. Outside, as seen in the glimmering mirror, there is full summer; the deep and glowing leaves have drunk in the whole strength of the sun. The sleepy splendour of the picture is a fit raiment for the idea incarnate of faultless fleshly beauty and peril of pleasure unavoidable. For this serene and sublime sorceress there is no life but of the body; with spirit (if spirit there be) she can dispense. Were it worth her while for any word to divide those terrible tender lips, she too might say with the hero of the most perfect and exquisite book of modern times— Mademoiselle de Maupin—“Je trouve la terre aussi belle que le ciel, et je pense que la correction de la forme est la vertu.” Of evil desire or evil impulse she has nothing; and nothing of good. She is indifferent, equable, magnetic; she charms and draws down the souls of men by pure force of absorption, in no wise wilful or malignant; outside herself she cannot live, she cannot even see: and because of this she attracts and subdues all men at once in body and in spirit. Beyond the mirror she cares not to look, and could not. time, passive and perfect: the outer light of a sweet spring day flooding and filling the massive gold of her hair. By the reflection in a deep mirror of fervent foliage from without, the chief chord of stronger colour is touched in this picture; next in brilliance and force of relief is the heap of curling and tumbling hair on which the sunshine strikes; the face and head of the siren are withdrawn from the full stroke of the light. After this faint essay at an exposition, the weighty and melodious words in which the painter has recast his thought (words inscribed on the frame of the picture) will be taken as full atonement for my shortcomings; I fear only that the presumption and insufficience of the commentator will now be but the more visible. 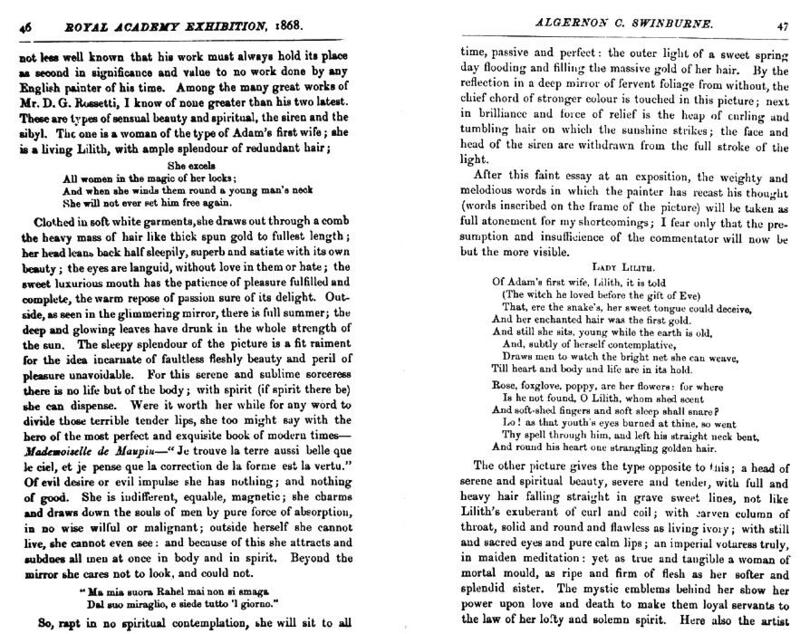 Note: Swinburne notes that his 1868 text is taken from the frame of the exhibited picture “ Lady Lilith.” The text, which was the first printing of the poem, varies from the later printings in lines 2, 9, and 11. And soft-shed fingers and soft sleep shall snare? alone should first be heard; and I, having leave to act as his outrider, give him the due precedence. After these all weaker words must fall flat enough; but something of further description may yet be allowed. 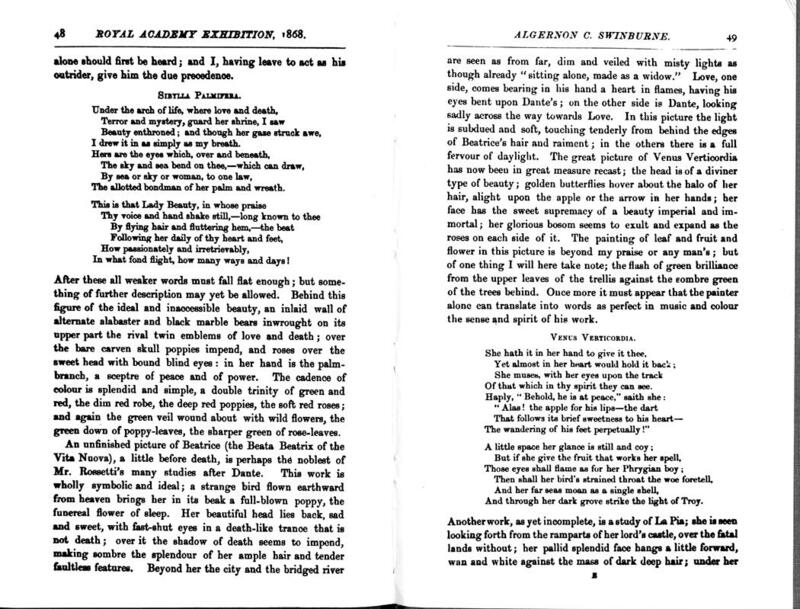 Behind this figure of the ideal and inaccessible beauty, an inlaid wall of alternate alabaster and black marble bears inwrought on its upper part the rival twin emblems of love and death; over the bare carven skull poppies impend, and roses over the sweet head with bound blind eyes: in her hand is the palm-branch, a sceptre of peace and of power. The cadence of colour is splendid and simple, a double trinity of green and red, the dim red robe, the deep red poppies, the soft red roses; and again the green veil wound about with wild flowers, the green down of poppy-leaves, the sharper green of rose-leaves. are seen as from far, dim and veiled with misty lights as though already “sitting alone, made as a widow.” Love, one side, comes bearing in his hand a heart in flames, having his eyes bent upon Dante's; on the other side is Dante, looking sadly across the way towards Love. In this picture the light is subdued and soft, touching tenderly from behind the edges of Beatrice's hair and raiment; in the others there is a full fervour of daylight. The great picture of Venus Verticordia has now been in great measure recast; the head is of a diviner type of beauty; golden butterflies hover about the halo of her hair, alight upon the sweet supremacy of a beauty imperial and immortal; her glorious bosom seems to exult and expand as the roses on each side of it. The painting of leaf and fruit and flower in this picture is beyond my praise or any man's; but of one thing I will here take note; the flash of green brilliance from the upper leaves of the trellis against the sombre green of the trees behind. Once more it must appear that the painter alone can translate into words as perfect in music and colour the sense and spirit of his work. And through her dark grove strike the light of Troy. unhands is a work of embroidery, hanging still on the frame finished; just touched by the weak weary hands, it trails forward across the lap of her pale green raiment, into the foreground of the picture. In her eyes is a strange look of wonder and sorrow and fatigue, without fear and without pain, as though she were even now looking beyond earth into the soft and sad air of purgatory: she presses the deadly marriage-ring into the flesh of her finger, so deep that the soft skin is bloodless and blanched from the intense imprint of it. Two other studies, as yet only sketched, give promise of no less beauty; the subject of one was long since handled by the artist in a slighter manner. It also is taken from the Vita Nuova; Dante in a dream beholding Beatrice dead, tended by handmaidens, and Love, with bow and dart in hand, in act to kiss her beautiful dead mouth. The other is a design of Perseus showing to Andromeda the severed head of Medusa, reflected in water; an old and well-worn subject, but renewed and reinformed with life by the vital genius of the artist. In the Pompeian picture we see the lovers at halt beside a stream, on their homeward way; here we see them in their house, bending over the central cistern or impluvium of the main court. The design is wonderful for grace and force; the picture will assuredly be one of the painter's greatest. La beauté est la seule chose au monde qui n'existe pas à demi. 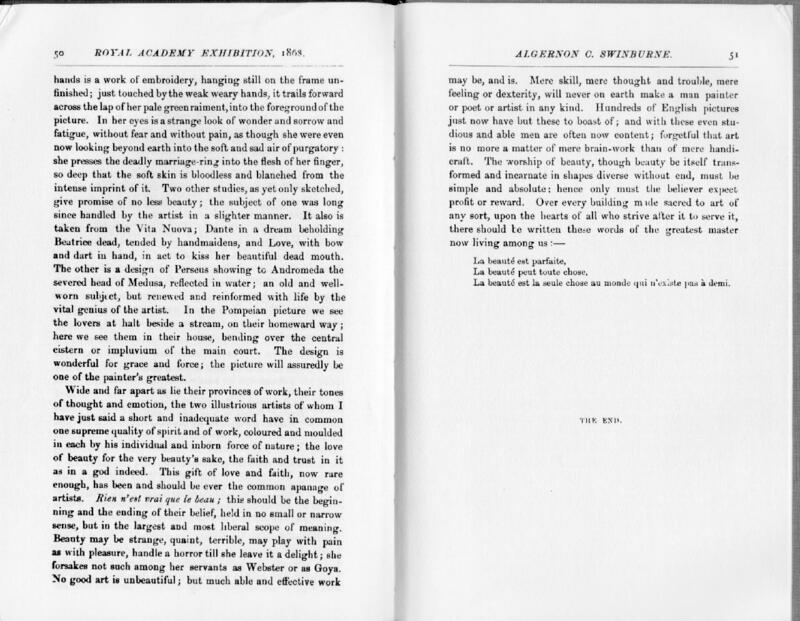 Copyright: Digital images courtesy of University of Virginia Special Collections.